“I can't do it!” is one of the most oft spoken terms in the English language. We know we can but the sheer frustration of it all makes us utter those words. Then we calm down, approach it from a different angle and voila; success. To keep trying and be determined to overcome obstacles is what life is all about, especially in the world of business. Whatever kind of business you are in you will know people who have muttered these immortal works, heck, you probably have yourself on more than once occasion. False sentiments of “yes you can” and “chin up” will hang in the air, but will do nothing to relieve the frustration of the person sitting there, who really thinks they can't do it. The solution? Pop online and send them these can do attitude corporate ecards. 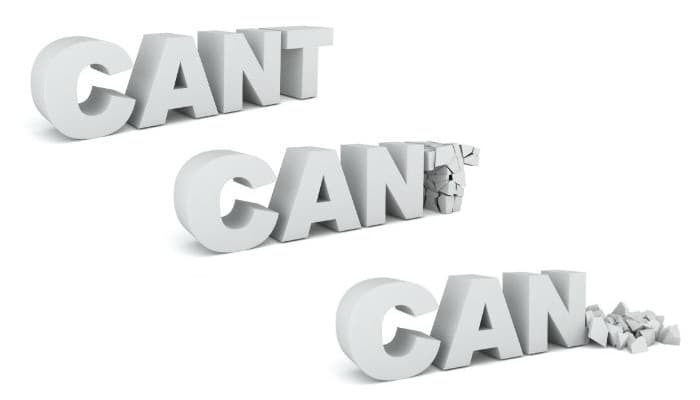 You have the word cant, then cant with a crumbling t which gives way to leave the word can. All you do it take away the t, simple but effective. Ecards will not disappear like words, the recipient can look at it time and time again to draw strength from the message; a lasting testament to remind them that when the chips were really down, you believed in them. Does you business choose to send holiday greeting cards at Christmas time? If so then we would love you to consider our Christmas ecards for business.